– Jay Brown (10 a.m. – 11 a.m.) Founding member of the old time, swing band Lazybirds, Jay has toured throughout the southeast and as far as Alaska and has performed at festivals such as Merle Fest, Bele Chere and the Rhythm & Roots Reunion. He has shared the stage with artists including Doc Watson, Ritchie Havens, Gillian Welch and Sam Bush. – Mountain Thunder Cloggers (11 a.m. – 11:30 a.m.) dance to many types of music – from Bluegrass & Country to 80s/Pop/Hip-Hop. A family-oriented team, they encourage the families watching them to join in! – Forge Mountain Cloggers (12:30 p.m. – 1:30 p.m.) LOVE to clog and they bring smiles and energy to their audiences. John Bowers and David Ray (guitar/mandolin) (1:30 – 2 p.m.) play a mellow alternative country genre and play weekends only. Sherry Lynn and the Mountain Friends Band (2 – 3 p.m.) play acoustic country and contemporary bluegrass. This is a strong team that combines fine musicianship and pure joy, giving audiences a highly entertaining show. Mark DeVerges (3 p.m. to 4 p.m.) is a true balloon artist. He will create a massive custom object/animal/creature right before the audience with the help of many volunteers in a way that incorporates science, education, and visual art! Following the show, Mark will amaze the kids with his award winning balloon twisting! Admission is $9 for adults, $5 for children, and FREE to Members of Friends of the Nature Center. Scrumptious food will be available at the Classroom Café onsite, so families can spend the whole day! This year’s generous Hey Day Gold level sponsors include Animal Hospital of Reems Creek, Harrington Electric Company and Dr. Ryan Haldeman, Orthodontist. Silver level sponsors include ABC Pediatrics, Allergy Partners of Asheville, Steven Cahan, Eye M.D., Greenworks Healing Center, Doug Sherry with Preferred Properties and the Toy Box. Media sponsors include Advantage Printing, Mountain Xpress and WOXL-FM. Hey Day will be filled with fun for the whole family. Events include pony rides (extra $), weaving and spinning demonstrations, soapmaking, crafts, face painting($), a clown show, The Rainbow and You – a special storyboard performance, watercolor painting, pumpkin painting (extra $) and the always popular cake walk (extra $). Visiting animals include rescue Llamas, Fjord Horses and Miniature Ponies. Enjoy educational exhibits from the Asheville Fire Department, Appalachian Sustainable Agriculture Project, Ashevillage, a chicken tractor expert, Doubletree Farm, Rainbow Recycling (inventors of the Recycling Stomp! ), Riverlink, Greenworks, Higher Ground Gutter Cleaners and Sundance Power Systems. lovers gather to celebrate their shared passion for adventure. and community spirit of REEL ROCK events. ASHEVILLE, NC – Raleigh based rock climbing and ice climbing guide service and climbing school has expanded it’s climbing class offerings to climbers in Western NC by offering their Climb Outside Rock Climbing Class on September 26-27, 2009 at Looking Glass Rock NC. These classes give people the knowledge, skills, and understanding they need to begin rock climbing outside. Asheville is an ideal location for these classes because of the volume of climbing areas, and the volume of people who desire to learn how to climb outdoors but aren’t sure where to get started. Students learn anchor building, rope management, knot tying, belaying, rappelling, rescue, and more. The class consists of 2 full day sessions, where the first day will be spent teaching the skills, and the second day will be spent putting the newly acquired skills into practice. The classes are open to all experience levels, and all equipment is provided. Details on the Asheville Climb Outside Rock Climbing Class can be found on the Climb Outside Website (www.ascentadventure.com). “Taking this class taught me a lot and confirmed things I had already been in the process of learning. Even though I have much more to learn it allowed me to feel confident, to go with my partner, and climb outside at my current level,” expresses Chris Troisi, a Climb Outside Class participant. For an interview, or to find out more information about the classes and unique services Ascent Adventure Consultants provides, please contact Brandon Hensinger at [email protected] or 877-254-4617. Also, visit the Ascent Adventure Consultants website to learn more. ASHEVILLE, NC – The North Carolina Arboretum’s “Speaking of Gardening” symposium brings six highly regarded designers, research specialists and nurserymen to the region on Aug. 28 and Aug. 29 to celebrate and explore great plants, new ideas and inspiration. Symposium topics include private and public garden design, new plants from NCSU plant research program, designing with grasses, new perennials from Jelitto and the Human Flower Project. Allen Bush: In the Company of Plantsmen Explore the values, mission and plants of Jelitto Seeds. Jelitto has specialized in production, cultivation and seed technology since 1957 and supplies seeds for over 3,000 perennials, ornamental grasses, aromatic herbs and more. In addition to headquarters in Germany, Jelitto has offices in the USA, UK and Japan. John Hoffman: Ornamental Grasses in Today’s Garden Using stunning photography and 25 years of experience, John Hoffman brings you the latest scoop on ornamental and native grasses. Gardeners, designers and landscapers will discover outstanding grasses and grasslike plants to use as architectural specimens, decorative-urn focal points, and in sweeps and masses. John will highlight tough-as-nails superstars, wonderful grasses that pack brute strength and environmental muscle into their good looks. In addition, you will get a peak at new varieties that excite the senses and spur the imagination. Tom Ranney: Making Plants from Scratch Learn how over the centuries, plant breeding has transformed and vitalized agriculture, civilization, and our gardens. Natural biodiversity in the plant kingdom provides the raw ingredients for fostering new plants with enhanced pest resistance, adaptability, and dazzling garden appeal. A firm scientific foundation coupled with the vagaries and randomness of genetic recombination can result in outcomes that defy imagination. The basic how-to of plant breeding and exciting new hybrids will be presented. Joe Eck and Wayne Winterrowd: Our Life in Gardens Enjoy a highly personal account of over 30 years of experience in the making of North Hill, which the garden historian Mac Griswold has called “one of the best private gardens in North America.” This lecture is not only a biography of a mature garden and autobiography of a relationship, but also includes valuable information on garden design and on the cultivation of rare and unusual plants. Joe Eck and Wayne Winterrowd: North Hill through Four Seasons Tour of one of America’s most celebrated private gardens as it changes through the seasons from spring to winter. Though North Hill is located in southern Vermont, Eck and Winterrowd, both professional landscape designers, have worked in climates as varied as San Diego, Montreal, Chicago and Kentucky. This lecture will be both an intimate tour of their garden and also a primer on essential questions of garden design. Allen Bush: Stories from the Human flower Project and Beyond Take a look inside The Human Flower Project, an international newsgroup, photo album and discussion of humankind’s relationship with the floral world. Various correspondents travel the globe and write about topics such as Art & Media, Cooking, Ecology, Gardening & Landscape, Medicine, Politics, Science and Travel. Learning the Lesson of Happiness: the A(ubergines), B(eets), C(arrots) (New Orleans), A Paris Garden with Iron Bones (Paris) and Hunter-Gatherer-Sculptor (Philadelphia) are a few titles and small sampling from Allen’s many submissions. Fred Hooks: Each Garden Is Different: A 30-Year Conclusion Founded on Fred’s extensive experience, the lecture addresses Post Properties and their creative application of landscape techniques to continuous shrinking spaces and the use of unusual plants in the right places, turning landscape into garden. Fred will also look at the use of maples in the garden and a brief review of some exciting new introductions. Continuing education credits are available. The “Speaking of Gardening” symposium is sponsored by patrons Joe Myers and Stephen B. Fisher and sponsors B.B. Barns, Inc, Snow Creek Landscaping, LLC, Doubletree Hotel Biltmore/Asheville, and Noland Interiors, Inc. Registration includes seven lectures, a book signing, plant giveaway, lunches and snacks and is $98 for Arboretum Society members and $114 for the general public. The symposium is limited to 100 participants. Register by calling 828-665-2492, Ext. 317 or visit www.ncarboretum.org. ASHEVILLE, NC – RiverLink hosts its annual Rockin’ RiverFest Saturday, including a Raft Race, Kids’ Parade, Music Showcase & Competition, local food and beer, vendors, arts performances and recreational activities. The festivities begin at 11 a.m. at the French Broad River Park with a Kids Parade for ages 12 and younger who can decorate their bikes, rollerblades or skateboards. Surprise judges will award prizes to kids for their creativity and green means of transportation. After the parade, there will be fun activities including face painting and hula hooping. The Music Showcase & Competition sponsored by 98.1 the River and the Musician’s Workshop starts at noon with local area bands competing for Best Band and Wild Wing’s Choice. For more information including raft race registration, parking information and free shuttles and schedule of events, please visit www.riverlink.org. RALEIGH, NC –Described by a British traveler as “an isolated rock, looming against the sky which is of circular form, and resembles the principal turret of a stupendous castle,” the 315-foot Chimney Rock monolith remains awe inspiring today. The natural marvel is a major tourist destination, and will be recognized by the N.C. Department of Cultural Resources with a N.C. Highway Historical Marker on Aug. 3. The 11 a.m. ceremony will be at the Esmeralda Inn. The marker will be placed at US 64/74A in Chimney Rock. Chimney Rock towers over the 14-mile long gorge in Rutherford County, in an area settled in the 1780s. Henderson County native Jerome Freeman devised a plan to build a stairway up to its summit and build a park around it in 1880, and made the necessary purchases. The stairs and a trail to the breathtaking Hickory Nut Falls, known as the “Appian Way” also were completed that year. Tourists began paying to climb to the top, including the physician Lucius Morse, who had moved to Hendersonville to relieve the symptoms of tuberculosis. The weakened Morse paid a man 25 cents to complete his ascent to the rock’s summit on a donkey. In 1902, the captivated Morse and his brothers purchased Chimney Rock in a 64-acre tract for $5,000. The automobile age made Chimney Rock a successful tourist destination. Completion of a bridge across the Rocky Broad River and the Chimney Rock Motor Road increased accessibility in 1916. Morse increased tourist appeal when he had the river dammed to create Lake Lure, and later added an elevator, driveway and parking lot. Environmental attractions and trails were added, including a Nature Center and guided walks, and educational opportunities. 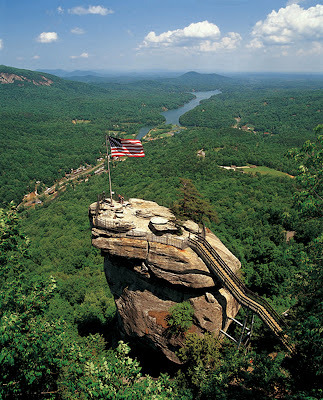 In 2007, the State of North Carolina purchased Chimney Rock from the Morse family. This 1,000 acres is the focal point of the still developing Chimney Rock State Park. For information on the dedication, contact Mary Jaeger-Gale at (828) 625-9611, x 813. For information on the Highway Marker program, contact Mike Hill at (919) 807-7290. ASHEVILLE, NC – Hatchery-supported trout waters opened at 7 a.m. on Saturady in North Carolina. These are waters stocked with thousands of catchable-sized brook, brown and rainbow on a monthly basis from March to August. This year, N.C. Wildlife Resources Commission staff will stock more than 818,000 trout, with 96 percent of the stocked fish averaging 10 inches in length and the other 4 percent exceeding 14 inches in length. When fishing on hatchery-supported trout waters, anglers can harvest a maximum of seven trout per day, with no minimum size limits or bait restrictions. These harvest regulations, combined with the generous stocking numbers, can result in some fantastic fishing opportunities. ASHEVILLE, NC – Mountain climber Ron Sanga will share a slideshow on his 2008 Mount Everest expedition March 21 and March 22 at REI Asheville in Biltmore Park. The presentations will be held at 3 p.m. March 21 and at 4 p.m. March 22. Sanga, retired in 1999 after 18 years of owning a company that climbed high rise buildings and repaired them due to storms or construction defects. Hanging from a quarter inch cable 200 feet off the deck every day led to his travels around the U.S. in an RV to find the perfect rock to climb after retirement. Two years later Sanga decided to try mountaineering, and since then has created an extensive mountaineering resume. Registration for this free presentation is requested. Call 687-0918 to register.